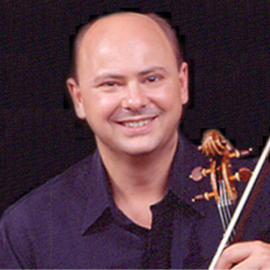 Romanian-born violinist ANDY SIMIONESCU is a graduate of the Curtis Institute of Music where he completed his studies wish Szymon Goldberg. Andy's solo appearances have taken him to the stages of Carnegie Hall, Lincoln Center, the Musikverein, Tokyo's Casals Hall and throughout the US, Europe, and Asia. Recital highlights include performances at the White House, the Kennedy Center, Library of Congress, New York's 92nd Street Y and Alice Tully Hall. A prolific chamber musician, he is a member of the Raphael Trio and Artistic Director of The Performers of Westchester.